Europe and Asia faces each other in the sports of Golf through one of the most popular golf team tournament Royal Trophy. Here is given the history, venue and result of this golf tournament which as held at Amata Spring Country Club in Bangkok, Thailand. 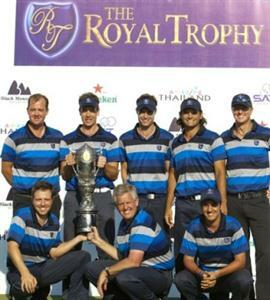 Royal Trophy is a men golf team tournament which is played between Asia and Europe Team consisting of eight man in each team. Five editions of this tournament has been played so far from its founding. In 2011, the tournament was played at Black Mountain Golf Club in Thailand. Except that all other editions of this tournament were played at Amata Spring Country Club, Bangkok (Thailand). Royal Trophy was first played in 2006 in which Europe team won against Asia by a score of 9-7. Europe team has dominated in this tournament winning it four times and losing only once in 2009. Naomichi Ozaki of Japan has captained the Asia team for four times. Top Scottish player Colin Montgomeire has captained Europe for two years in 2010 and 2011. Here is the complete list of results of Royal Trophy.